Executive Mosaic is glad to unveil Tim Hurlebaus, president of CGI Federal, as an inductee into the 2016 edition of the Wash100 — Executive Mosaic’s annual selection of influential leaders in the government contracting arena. Hurlebaus was promoted to the position in April 2015 from his prior role as senior vice president of the national security and defense programs unit at CGI Federal, a subsidiary of the Montreal-based global technology services contractor. 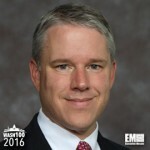 He was responsible for CGI Federal’s programs with intelligence agencies, the departments of Homeland Security and Justice, the General Services Administration, the U.S. Air Force, Navy and Marine Corps during his tenure as SVP. The subsidiary is one of 50 contractors selected by the Defense Intelligence Agency in July 2015 for a potential six-year, $50 billion contract vehicle to provide information technology support services to defense and intelligence agencies. His previous roles at CGI include manager of the procurement solutions group, head of strategic growth efforts in Asia and Europe, and leader of strategic sales and business engineering operations for the company’s U.S. enterprise markets group. The 25-year consulting and information technology industry veteran is a member of the U.S. Executive Management Committee and the Strategic Growth Council. Executive Mosaic extends its congratulations to Tim Hurlebaus and the CGI team for their selection to receive this award.